He Thought His Buildings Were Alive | What Next? 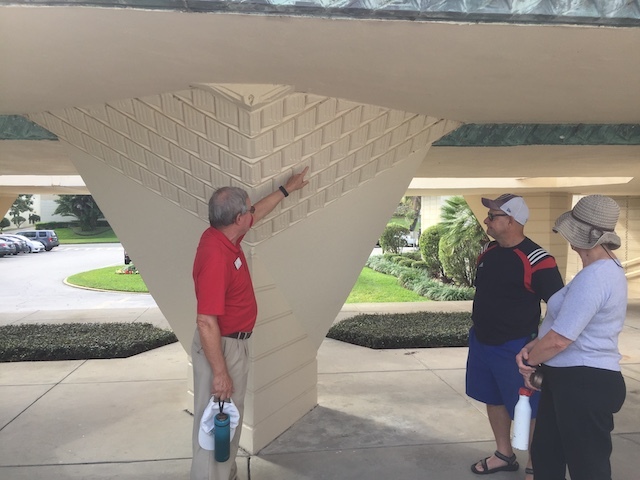 “I didn’t feel much like a father to my children, but I did feel like a father to my buildings.” We took a tour of some of the eighteen buildings on the Florida Southern College Campus in Lakeland that were designed by the famous architect Frank Lloyd Wright. Apparently Frank thrived on being at the college campus and loved to hang out with the students and get to know them. Unfortunately his love for, and interest in, the young people at the university did not extend to his own children. Frank was so busy with his career he had little time or understanding for his eight children, the result of three marriages. I first learned about Frank Lloyd Wright from reading Nancy Horan’s book Loving Frank which details an affair he had with a married woman who left her own children for him, and I must admit it left me with little respect for how he conducted his personal life. 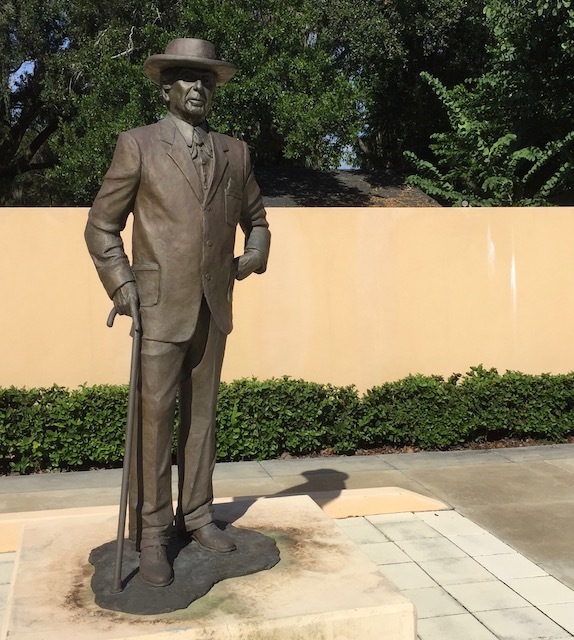 Dave and I had also toured Frank Lloyd Wright’s Taliesan West campus in Arizona and his Oak Park Home in Chicago so we were interested to learn more about the famous architect and the work he did at a Florida college. 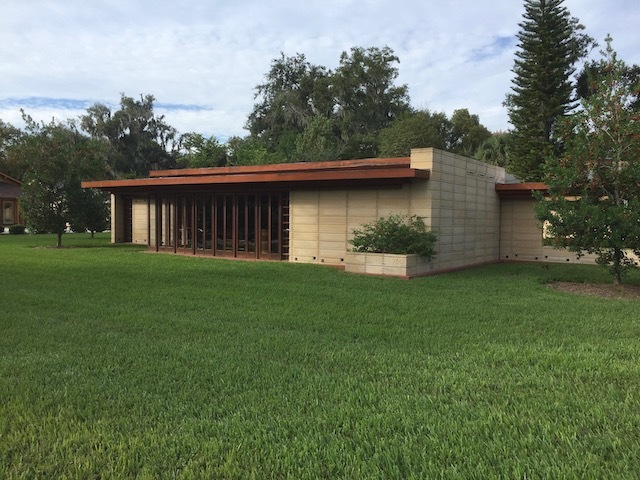 Frank Lloyd Wright designed homes like this one called The Usonian without curtains to let the ‘outside in.’ The way the sun reflected shadows onto the floors in patterns was also important to him. Wright believed buildings were alive which is why he used the color Cherokee Red in so many of his buildings- it reminded him of blood. Check out the red floor in the Usonian house above. 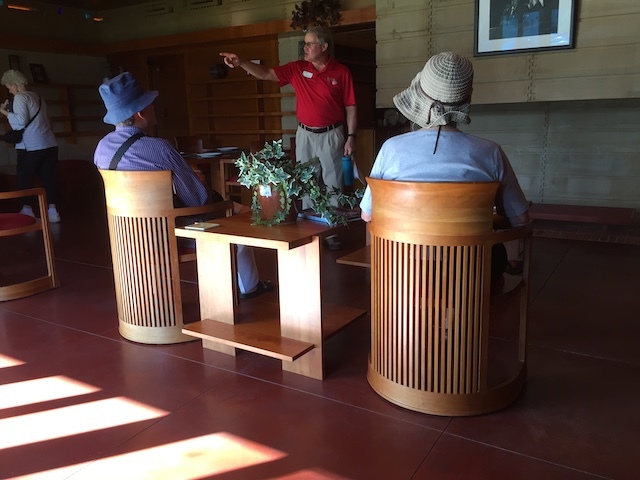 Our friends Barb and John sit in chairs designed by Frank Lloyd Wright while our guide shares his encyclopedic knowledge of the designer and architect. 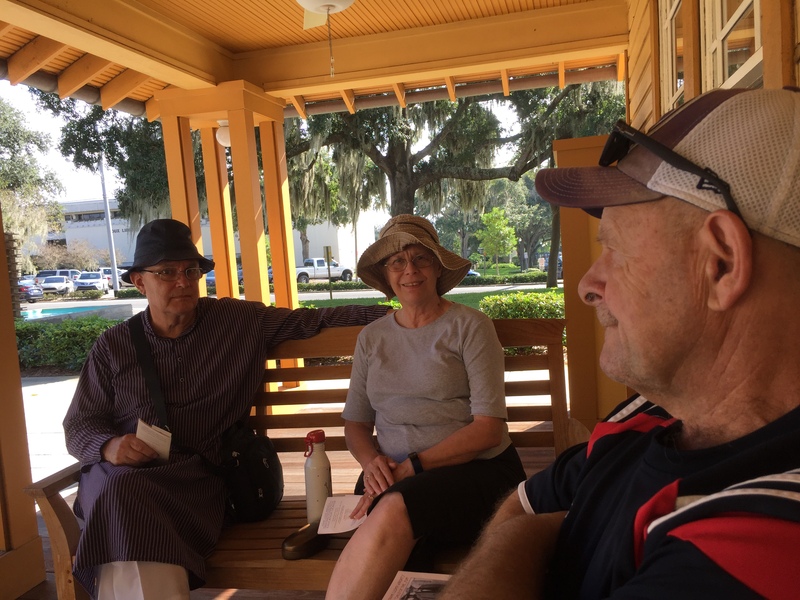 We learned many fascinating things about Frank Lloyd Wright from Paul our knowledgeable guide who told us he’d ‘drunk the Kool-Aid’ when it came to the unorthodox and often controversial American architect Frank Lloyd Wright. Frank not only designed buildings he designed their furniture as well. Here I sit at a diningroom table he designed. 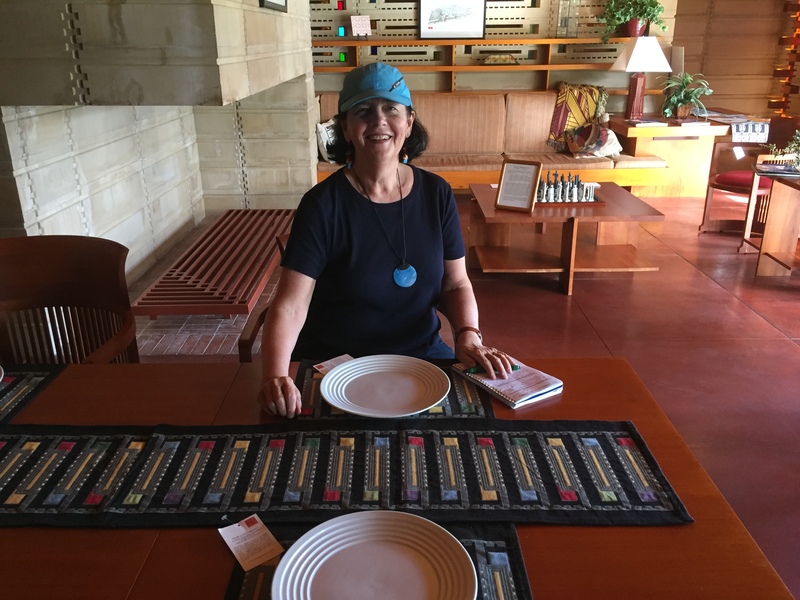 The place mats are based on window patterns in Frank Lloyd Wright buildings. Frank drew the blueprints for houses like The Usonian for faculty and staff of the university to live in. Wright also designed this Water Dome fountain at the centre of the campus which shoots water up to 45 feet into the air. 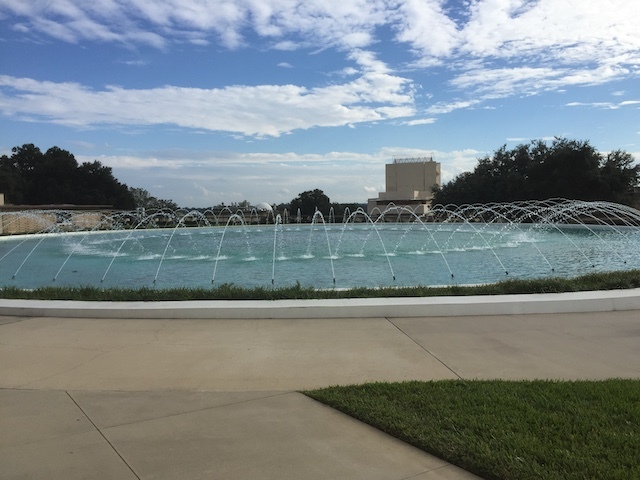 It uses a great deal of water however so the full force of the fountain is saved for displays on special days on the campus like graduation. 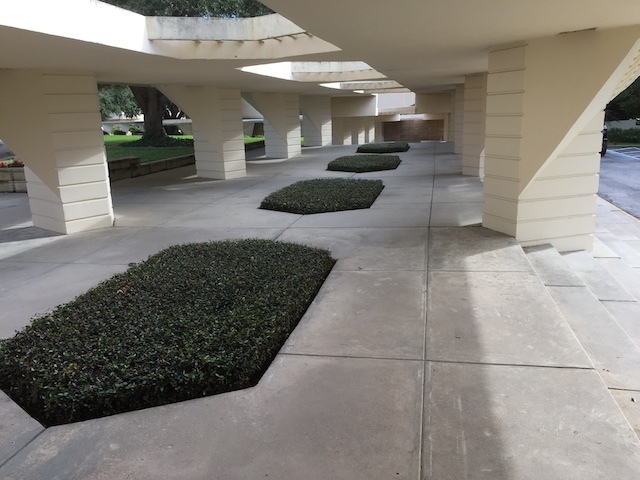 The various buildings designed by Frank Lloyd Wright on the college campus are connected with over a mile of esplanade. 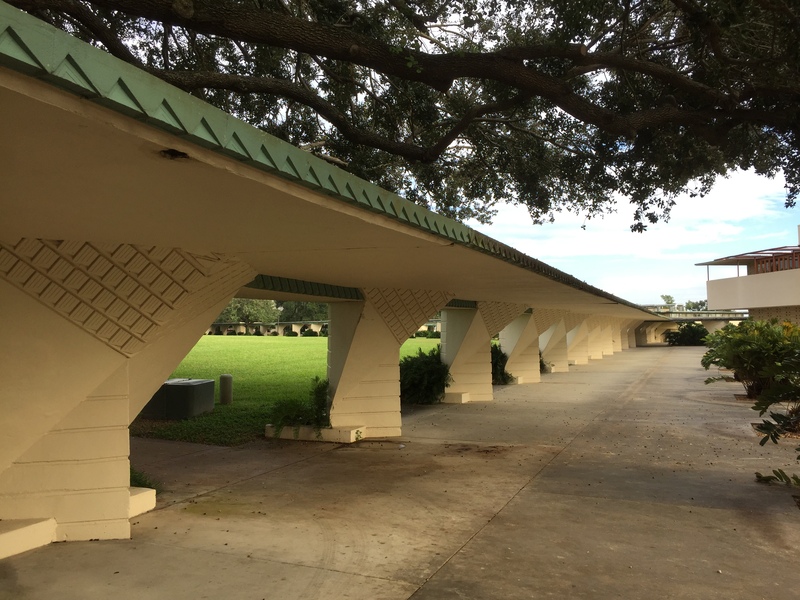 The supports were to be reminiscent of the orange trees that once grew all around the campus. Each of these beds of green shrubs are exactly 10 feet apart which is how far orange trees are generally planted apart in an orchard. 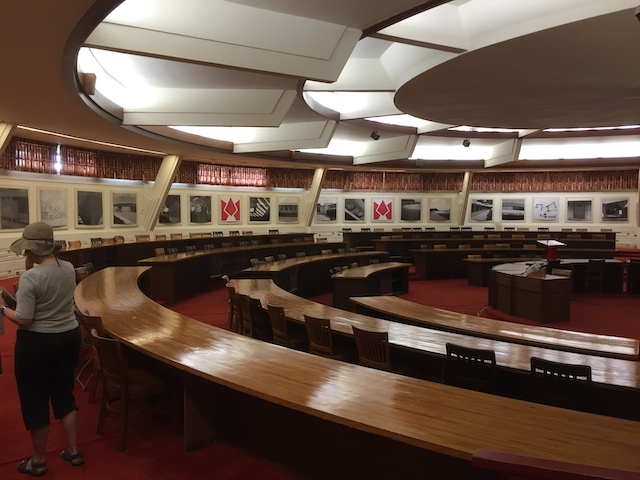 Frank Lloyd Wright also designed the campus library. Frank was always trying to imitate nature in his buildings. 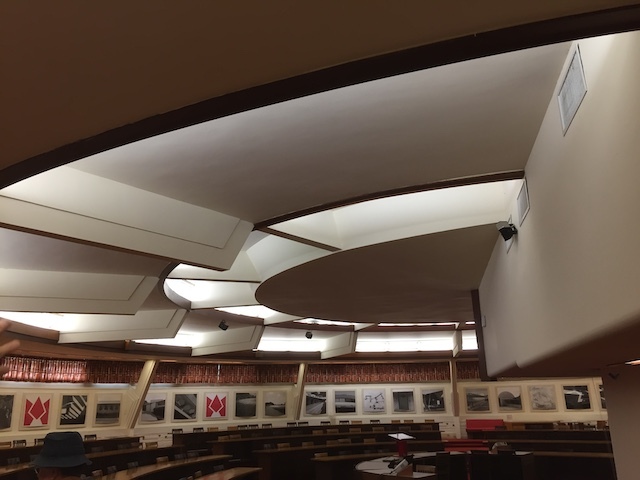 He designed the ceiling of the library to look like the sun. 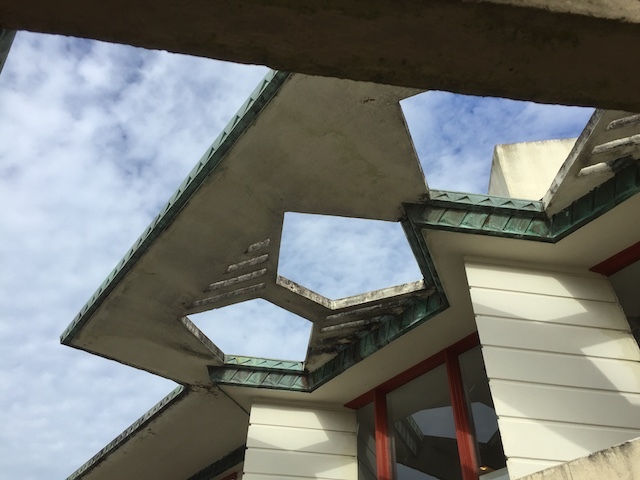 This overhang on one of his buildings features a butterfly design. Check out the Cherokee red steps on the Annie Pfeiffer Chapel which Wright designed. 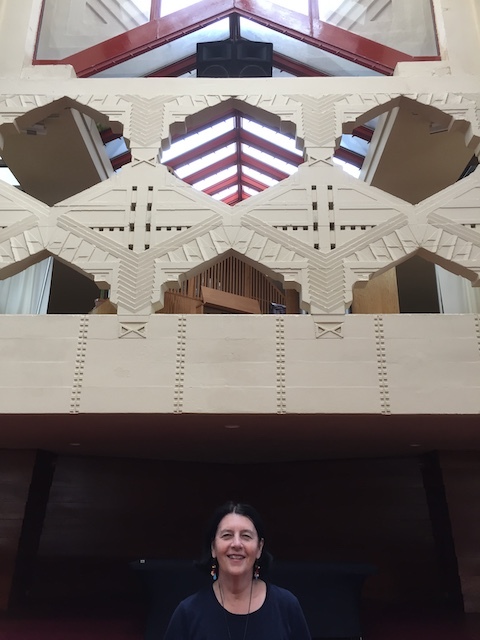 Inside the church- the facade which partitions off the choir and pipe organ from the sanctuary is decorated with origami shapes and re-creations of the First Nations symbol The Thunderbird. 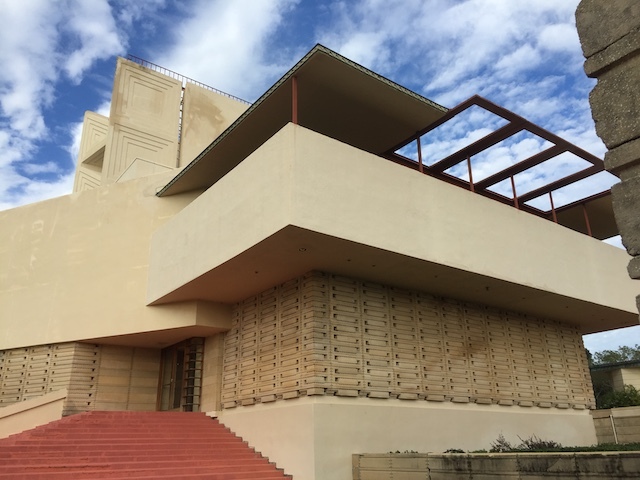 Unfortunately the church like many other buildings on campus designed by Frank Lloyd Wright didn’t turn out to be as practical as they are beautiful. They have lots of construction problems and are constantly in need of repair. It is hard for the university to keep up financially with all the work that needs to be done. 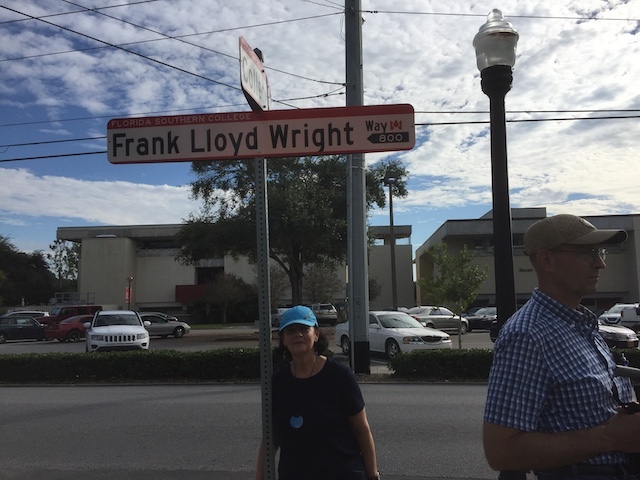 Standing on Frank Lloyd Wright Way on the Florida Southern College campus. 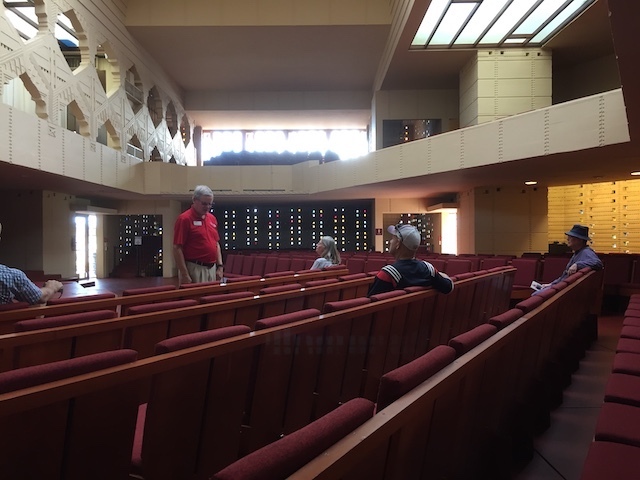 We learned from our guide that Frank Lloyd Wright was not one to take advice from ANYONE not even his clients. You did things his way. Maybe that’s why one of the streets on the campus is named Frank Lloyd Wright Way. What Will You Be Building When You Have To Go? Interesting. He also had an unhappy marriage with Svetlana, daughter of Stalin.